My Mother Made Me Do It – Find You in the Sun – A daughter's slow waltz with her mother's dementia. Rummaging in my office closet for a magenta print cartridge, I blindly fumbled with and flipped open a white binder. THE white binder. I stared long at the plastic case then opened the folder and turned the pages, running my hands across pen imprints as if the words had been freshly written. Suddenly, tears began to fall. Mid-binder, I had placed 100 sheets of legal paper, all three-holed punched and marked with dates of years ranging from 1999-2000. Each sheet had been assigned a number. Each number corresponded to the number of days my first husband, Devin, had been treated for a bone marrow transplant in Seattle, across three time zones from Ohio. But those sheets didn’t represent personal journal entries. The papers also didn’t represent emails or letters written to me, Devin, or Davis. The documents didn’t contain reports of Devin’s medical condition, at least not directly, though he and I tracked everything like my mother used to follow Lenten traditions, with anticipation and devotion. The pages represented something else. Fifteen years had passed since I put that binder together. Certainly, the binder had plenty to say to my older, wiser self. I engulfed myself in my own words, seeing them and my emotions for the first time again, raw, handwritten, on fire. By the time I had paged through to the end of the legal paper stack, I had learned something new about myself. My mother made me a writer. No. She didn’t force me to become one, but it’s because of her that I did. Long ago, becoming a writer didn’t happen for me because my mother reread Where the While Things Are until was no longer afraid or because my mother shared her book collection with anyone willing to take on the classics. I wasn’t made a writer by my mother’s editing of books I wrote in first grade. Becoming a writer didn’t happen because of the annual summer march we made, as a family, to the Amherst Library to participate in the summer reading program when I flew through books like my son still flies through ice cream, with imagination and delight. I didn’t become a writer because my mother made certain I was placed into Mr. Redman’s fifth grade class, a teacher whom I would consider the most influential artist in my life. A teacher who lived the creative life and demonstrated to unknowing fifth-graders what the creative life meant. Before being a creative was a buzz-word, it was a way of life. Outsiders called him weird or a hippie for wearing a beard and riding his bike. Those of us in his class knew better. My mother didn’t have to force me to spend teenage summers in my bedroom, reading Anne of Green Gables or Jane Eyre, when my siblings were off on some neighborhood adventure. And she didn’t have to encourage me to digest the newspaper. She never read the essay I wrote my college freshman year for Ms. Jones, an instructor without an English degree who pulled me aside and suggested perhaps I was in the wrong major. I was nineteen, what did she know? I majored in computer science instead. Throughout my early professional career, I never had cause to write, other than training manuals and business plans. I observed as my older sister wrote press releases, and learned from her, but that wasn’t writing, really. That work only had to do with getting paid. During that time, I had felt stunted. I wasn’t using the best of my skills though I could not articulate exactly what those skills were. In reality, I was lacking passion with no idea on how to locate that desire for myself. As I progressed into adulthood, marrying my former boss and birthing a son, tragedy entered my life when Devin was diagnosed with leukemia. What I didn’t know then was that passion would find me and help hone my writing voice through my advocacy. Passion found me, when I needed it most. Devin progressed through three years of treatment. His final year, we spent months in Seattle where Devin underwent a bone marrow transplant. We had already relocated back to Ohio from Oregon then made the temporary move to Seattle. I was 2,000 miles from the people who loved us most, other than Devin’s parents. The entire program consisted of a 90-regimen of out- and inpatient testing and procedures, some deadly, others death-defying. How we persevered through that phase remains a mystery to me. The only proof that I was an actual participant in that struggle is in that binder. We had arrived in Seattle two weeks prior to the start of Devin’s program. Some testing began prior to his actual admission. 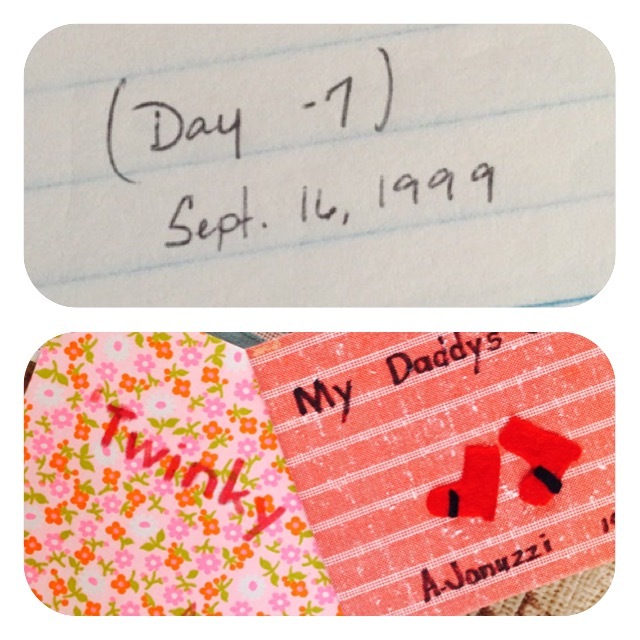 Those days were labeled Day -7, etc. The day of his transplant, September 23, was Day 0. Devin was released and we returned home long past Day 90. During that time, I had already been acting as the family scribe through emails, updates and my own journal keeping. Devin had attempted to do so, but for many days, his hands and mind were unsteady for that kind of work. When Devin began his Day -7, I needed my own regimen to persevere. Writing as scribe had come naturally, so I wrote. One hundred letters home to Ohio. I always used a single page from a white legal pad, and bought up legions of legal pads and stamps and envelopes. I knew where all the mail drops were in our Seattle neighborhood and the hospital. I kept scribbling through Day 13 and Day 29. Then not so soon, Day 50 and 79 arrived. And finally, Day 90. Eventually, our little family landed back in Ohio and I completed the correspondence with my mother on Day 100. Throughout that time in Seattle, my mother and father had traveled west to help. Despite my mother sleeping in an apartment one floor below, I continued to send letters to her home in Ohio. What happened in our little room, or little square box of an apartment, was often different than the face we presented to the outside world, my parents included, as they were often pre-occupied taking care of little Davis while I took care of Devin. Something indescribable occurred in those 100 plus days. My writing had not been altered in any conceivable manner. My writing had not transformed into more narrative storytelling. But, my writing had transcended my experience on the ground, allowing my soul to take flight to destinations my body could not travel and places I could not allow my mind to go. I’ve been saving your letters. Those words changed the course of my life. Six or seven years ago, perhaps earlier, my mother began her long slide into dementia. My mother would never know, I would never know, how her holding my words, holding that space for me to spill my deepest darkest fears was a sacred act. My mother would never know she had become the sounding board for my soul. My mother would never know she made me a writer. I would later learn, this practice of active listening, of holding one’s words was an everyday occurrence at Women Writing for (a) Change. When I found WWf(a)C, I felt every woman in that room was my mother, embracing my words across miles, time zones, and joys and tears. As I reread the contents of that binder, my grief became raw once more. My mother had just been released from the hospital and again, I was forced to assess where she was along the “life with dementia” continuum. Would she survive this next incident? They say once you experience a deep grief, such as the death of a spouse, every loss thereafter feels deeper. Days of sitting in her hospital room had intensified my grief. Despite her release, I had begun to miss a different mother, the mother who had cradled my words. Mom never judged those words, but took them in, daily with her vitamins. She swallowed them for me, when I didn’t have the capacity to do so. Her hugs now pierce me to the core because I can feel her holding me, and feel those words I will pen about her. I can feel her shift inside as she moves towards a place that I cannot travel, that not even my words can get through. Only hugs. But I go on. I maintain the blog about my experiences with her dementia. My poems capture an image of her I cannot articulate otherwise, something so beautiful and mysterious and deep. I write and I write and I work at the writing about her because words and works can save whatever is left inside her still to be born, and there is plenty on good days – and bad. My final closing in the Day 100 letter was this: “All my love and gratitude for being a faithful companion on this pilgrimage.” My mother had only read 107 days worth of my words but she carried me with her, 24/7, giving birth to them, to me. My mother made me a writer. She read my words and saved me from days of uncertainty and nights of fear and heartbreak. Now, I embrace my mother, in words and hugs, to save her from days of confusion and nights of worry and hold her heart in place. Next Cognitive Decline or Just Obstinacy? “She had become a sounding board for my soul. My mother would never know she made me a writer.” Beautiful, Annette. One of your strongest and most powerful. Namaste (as you handle this yoga called Life). “My mother made me a writer. She read my words and saved me from days of uncertainty and nights of fear and heartbreak.” There are so many readbacks in this piece, but I love the straight forward gratitude in these two lines. It’s an amazing gift that she gave you– her unconditional support and love. It is so wonderful that you get to give so much back to her now. Looking back, looking forward, such a juxtaposition. You captured it so beautifully. Wishing you health and peace.